Cheppi (bland taste) kheeri (kheer in Marathi means ‘payasam‘ or ‘pudding’, the dish I am referring to is ‘kheeri‘ the difference may be because there is no sugar in it) is a festival dish. At my native it is usually prepared as the offering to god on the next day of Janmashtami. (I explained about Janmashtami rituals yesterday, I have uploaded some of the pictures that I had clicked last year on Janmashtami). On Janmashtami all the decorations are done as shown here, the next day, some rituals are followed to take out these decorations. The poojari (or bhatmam) goes to the places where he had kept the saligram and bala-krishna statue previous day. He does the pooja and offers ‘cheppi kheeri‘, ‘cow’s milk’, ‘venti randayi‘ to god. After the offerings are done, bhatmam takes off the decorations and takes his saligram and bala-krishna statue back with him. The tulsi and other decorations are discarded near ashoka katte(a round stone structure beneath the tree where the poojas are offered). ‘Venti randayi‘ is a side dish prepared by cooking chana and colocasia leaves and stems (venti literally means stem) in coconut gravy. Usually a few pieces of leaves are tied into knots and put into the dish, this is the specialty of the dish). Following is the picture of the leaves being cut (taken during Janmashtami 2005 at my native, last year I didn’t know I would be writing this post, otherwise I would have taken the detailed pictures). 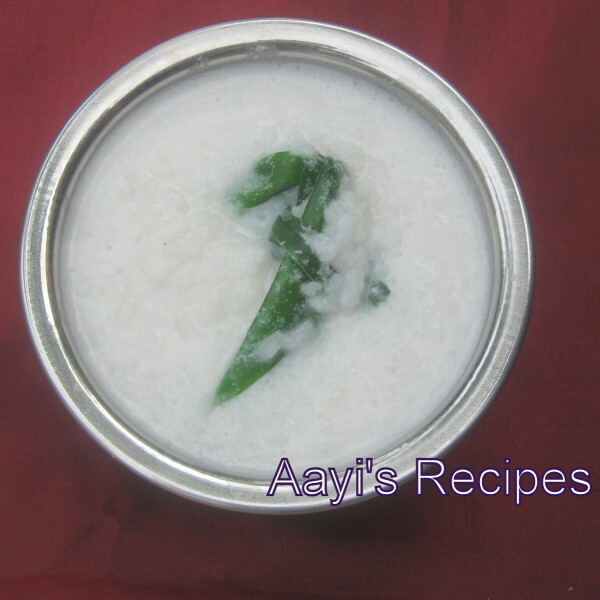 ‘Cheppi kheeri‘ looks like Rice congee, but since coconut or milk is used, it looks completely white. The main aroma of this dish comes from ‘turmeric leaves’ (haldi panna). These leaves are grown at home and usually used in variety of dishes for their aroma. (I do not think these are available outside India). Cook rice. Grind coconut with enough water to smooth paste. Add this paste to rice and cook. Tie each turmeric leaf into a knot and add to the dish. People like it to eat with or without salt. The leaves are discarded while eating. Grind coconut with enough water to smooth paste. Add this paste to rice and cook. Tie each turmeric leaf into a knot and add to the dish. Thanks for a detailed post on the rituals in your region. Are these knots of turmeric leaves eaten? Or should they be discarded? I have used Turmeric leaves only during Pongal. In Tamilnadu brahmin households, on the day after Sankaranthi, in the early morning, the women of the household make tiny balls of various rice (curd rice, sweet pongal etc) and leave it on turmeric leaves for the crows to eat. This is on the day of Kanu Pongal. Turmeric leaves are used in South East asian cookery, I don’t know for what. I have found fresh leaves in Japanese/Indonesian/Filipino/Thai stores. It is in the fridge along with kaffir lime leaves and shiso leaves. Aruna, thanks for reminding me of ‘alvatti’. I have added the name to the post. I am not aware of corn, sugarcane or bamboo to this. I will try adding them when I prepare it here. Vidya, I forgot to mention…the leaves are discarded while eating. they are just put for the aroma. You have given me a nice piece of information. I will look for them in Chinese grocery. BTW..I didn’t know they are also used by tamilians. Thanks a lot for the lovely information. What is Dosa Rice? Is it any special kind of rice? Is it available in Indian stores? I remember “cheppi kheer” being served in my household but do not remember the taste. Dosa rice is a bit different than the normal sona masoor rice. It is a bit thicker. It is usually available in India. I dont know if it is available here. Use normal rice if you cannot find it. Hey thanx for rearranging the categories….its made life a lot easier. You sure know how to spoil your readers and pamper them…..keep the good work going. I have now stopped taking down recipes. This site is an easy access to all of them. It’s also a good link to provide to new brides…sure helps ease their anxiety. I do have the same murthiin india. Nice write up about krishnastami. Thanks a lot for the nice words Preeti. Sudeepta,I am still thinking about Gowri pooja. I don’t have any pictures of the celebration with me :(. Since I had attended Janmashtami last year at native, I had clicked the pictures. This festival is my favourite amnong all hindu festivals. I am just so curious to taste this dish, never really tasted anything made with turmeric leaves. DO you think we can get the leaves in an INdian store? Thank you for the recipe. Archana, this dish is very famous during Konkani festivals and loved by many Konkanis (excluding me :D). I dont think turmeric leaves are available in Indian store. But Vidya(in the second comment above) says they are available here South eat asian stores. So have to check now :). This cheppi cheeri had me fooled every time during this festival as kid..i used to b served and the fragrant haldipaan used to fool me into believing its sweet 🙂 i used to ask for sugar to b served only after tasting it, alws thought that mum forgot to add sugar, till i was told when in 8th or 9th std that this is supposed to be ‘Cheppi’. Tks for bringing out the old memories! Thanks for this website its awesome especially for newly weds like me who never entered the Kitchen in my amma’s house! I live in Mississippi & since its my 1st Gowri puja away from home ;( i wanted to make it special for hubby & me. I cant find turmeric leaves here & i am very keen on making Cheppi Kheer any suggestions?? Should i skip the haldi paan (though i know the flavour comes from that to this dish). Shilpa: Yes, skip the leaves. There is no replacement. Your recipes are gorgeous. Keep up the good work and Best Wises. BTW, when you say dosa rice – do you mena raw rice or boiled rice?